The Polo Club at Mountain Island Lake is a wonderful 55+ community in Charlotte, North Carolina. True to Epcon Communities homes, every residence in The Polo Club at Mountain Island Lake is low-maintenance with luxury finishes. With outdoor living areas, single-story architecture, and privacy active adults are attracted to The Polo Club at Mountain Island Lake. This quiet enclave of ranch villas provides great amenities to live a socially and physically active lifestyle. The Polo Club at Mountain Island Lake is walking distance to numerous shops, restaurants, and services throughout Charlotte. With just a 20-minute drive to downtown Charlotte, it s easy to see why this is popular community for today s active adult. At the center of this active adult community is a charming 3,000 square-foot clubhouse. Residents enjoy gathering here for games, activities, and event. With a catering kitchen and plenty of tables, clubs can gather here on a regular basis. With an outdoor pool and patio, a grilling area, and welcoming lounge with a fireplace the clubhouse is a great feature to The Polo Club at Mountain Island Lake. Residents can stay fit by utilizing the exercise room and walking rails. Epcon Communities began construction of The Polo Club at Mountain Island Lake in 2008. The attached villas are arranged as quad configurations in a unique pinwheel design that gives each home a distinctive single-family home look and feel. Nine floor plans are being offered on a resale basis. These range from 1,137 to 1,992 square feet in size with two to three bedrooms and two bathrooms with an attached garage. Although the majority of these homes are attached, there are some detached single-family homes. The Polo Club at Mountain Island Lake is located in Charlotte, North Carolina. Both Wal-Mart and Harris Teeter are located just outside of this community, making grocery shopping a breeze. There are over ten restaurants nearby providing a variety of types of cuisine. Latta Plantation Park and Equestrian Center is a popular recreation in the area, as well. 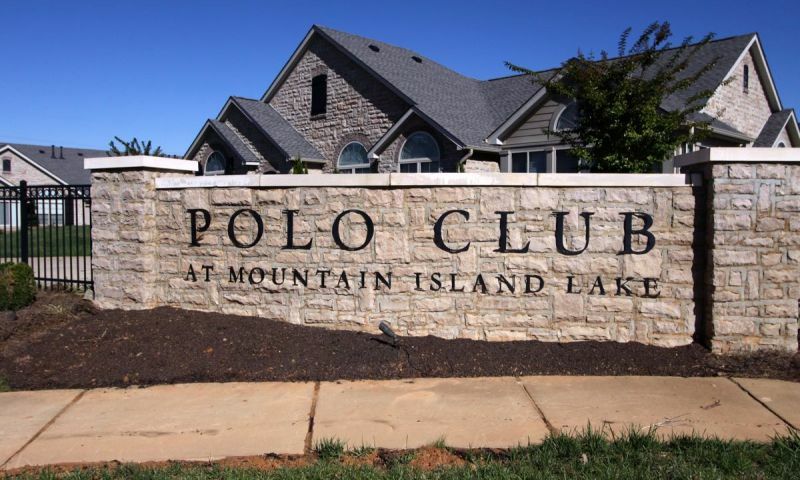 The Polo Club at Mountain Island Lake is only about 15 minutes away from Charlotte Douglas International Airport. It s convenient location just off of Interstate 485 makes traveling anywhere a breeze. With such a convenient location, mild weather, and low-maintenance homes The Polo Club at Mountain Island Lake is a great community for active adults looking to move to the Charlotte Area. Check back soon for more information on the lifestyle in The Polo Club at Mountain Island Lake. Epcon Communities plans to have 98 villa homes built inside of The Polo Club at Mountain Island Lake upon its completion. The majority of these floor plans are attached homes, however there are a few detached single-family homes offered. Ranging from 1,137 to 1,992 square feet in size these homes offer two to three bedrooms, two bathrooms, and an attached garage. Some additional features include dens, stone exteriors, 42-inch cabinets and granite countertops. Excellent Location! Friendly, Energetic Residents! Amazing Social Committee with Variety of Activities for everyone! 9 Wonderful Floor Plans - and sound does not carry through the walls like in some condos, unbelievably quiet) and only 12 minutes from NorthLake Mall, easy access to 485 and Uptown as well as Lake Norman Area. Workout Facility in Club House very convenient! The size of the Community is Perfect! So fortunate to have found Polo Club!!!! My name is Keith Sanders. I am a 3 year resident of Polo Club at Mountain Island. The community is nestled close to Mountain Island Lake which can be seen as the trees turn in the fall. I enjoy the tranquility of this community. After a long days work, the environment surrounds me with tranquility. My wife being a interior designer pampered our home with a mix of the ecliptic and modern decor. There is no better to live than in the Polo Club. Asree and I love the professional way the grounds are maintained and the amenities that are offered here. I moved to the Polo Club at Mountain Island Lake, Charlotte, NC on Feb. 5th, 2010 from Lake St. Louis, MO. I retired and returned to my home state. I love living here, and I think the community is very lovely. We have a nice club house, pool and use the club house for activities. The people have moved here from many states, and we meet, mix and mingle very well. By the time the project is finished June, 2014, and we have all of the finishing touches, I know we will be very pleased. Come and join this 55 and older Gated community!! We have lived at Mt. Island Polo club since Dec. 2012. We love everything about our community. They offer plenty of get togethers, so you can stay as active as you like. Super friendly place to live. all homes have beautiful landscaping that the owners don't have to worry about, they are taken care of weekly. I'm so glad we made the move, I feel like I'm on vacation every morning I get up. I decided in this community because of the beauty of the homes; it is a village with personalized villas, it is peaceful, safe, and most of all maintenace free. It is also conveniently located to shopping areas, airport, parks. It is a twenty-five minute drive to uptown Charlotte where there is a variety of restaurants and sources of entertainment, and public transportation is also available. If I had my way I would rename it the Mountain Island Village or Vista. Polo Gate Blvd. has the potential of becoming an amazing community with several enhancements; including but not limited to a fountain in a seafoam colored pond,more than one entrance and exit to the community, additional pool, to benefit the growing community, gazebo, and walking trails. I retired in 2009 and moved to Charlotte for golf and warm weather. My Daughter lives across Rt. 16, about five minutes away, she brought us to the Polo Club so that we would be closer to her. We fell in love with the area, the neighborhood and the convent location. Living here four going on five years now, I have made friends with all the neighbors and get to meet and greet the new ones as they move in. We are, for sure, an active as you want, community. Come and see for yourselves. My husband and I decided, three years ago, to downsize and move closer to our daughter. Two years ago we moved into The Polo Club and have never looked back. We are in our "approaching 80" years and enjoy the community spirit that is everywhere. It is a joy to see old fogies like ourselves, as well as youngsters in their fifties and sixties, all enjoying the activities that are available to all. Our home is beautifully constructed, well maintained outside, and built with age-related accessibility in mind. We feel truly blessed. 55places.com is not affiliated with the developer(s) or homeowners association of The Polo Club at Mountain Island Lake. The information you submit is distributed to a 55places.com Partner Agent, who is a licensed real estate agent. The information regarding The Polo Club at Mountain Island Lake has not been verified or approved by the developer or homeowners association. Please verify all information prior to purchasing. 55places.com is not responsible for any errors regarding the information displayed on this website.